Keep ’em coming! I can’t wait! Looks good! Will 1.2 be a free upgrade for 1.1 registered users? All 1.x releases are free upgrades. 1. Choice of category when adding a new feed, as in Safari’s Add Bookmark. 2. Have feed errors bubble up to the category level, so they can be seen when the category is collapsed. If possible, could you make Newsfire read the cache faster? 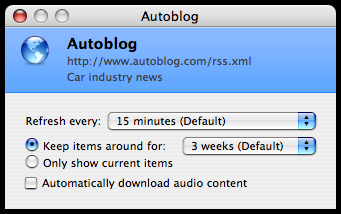 I have quite a number of articles, and blogs, and it takes about 2-3 minutes for it to start up. Love this app! Is there any way to edit the configuration files directly so I can add a whole bunch of feeds instead of going through the UI?